Side 1: 1. I'm Set Free (5:07) / 2. Walk And Talk It (2:06) / 3. Lonesome Cowboy Bill (3:43) / 4. Sneaky Pete (2:38) / 5. I'm Waiting For The Man (4:07). Side 2: 6. New Age (6:04) / 7. The Ostrich (2:06) / 8. White Light/White Heat (4:28) / 9. Sweet Jane (5:30). Sources: 1, 3, 5, 6, 8 : Max's Kansas City, "July 26, 1970" / 2 : Max's Kansas City rehearsals, Summer 1970 / 4, 7 : The Primitives 45, 1964 / 9 : Max's Kansas City, August 23, 1970. 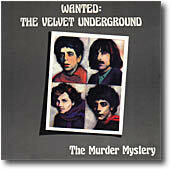 Notes : this record was the first Velvet Underground bootleg LP ever released. The title refers to Sweet Jane lyrics: "And there's some evils mothers, well they're gonna tell you that everything is just dirt". It offers both sides of the pre-VU Primitives 45 and some unreleased live tracks recorded by Brigid Polk at Max's Kansas City in 1970. However Lonesome Cowboy Bill, I'm Waiting For The Man, New Age and Sweet Jane are actually the same as on the official Live At Max's album! 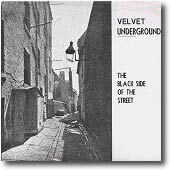 The Lou Reed photo on back cover was shot by Nat Finkelstein and is actually picked up from The Velvet Underground & Nico liner. Black & white "dog in airplane" drawing label. Both labels and back cover mislists Sneaky Pete in place of The Ostrich. The record was released by the early incarnation of the Skydog Records label, run by Marc Zermati in Paris with a Dutch partner. They originally released a legit royalties paid version of the Jimi Hendrix Sky High. 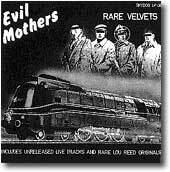 However Evil Mothers was definitely not an approved release. And the collaboration ended after the Dutch partner bootlegged the Brigid Polk's tape that was given to Marc. Les Inrockuptibles Superstars booklet says that 2000 copies were originally pressed, but most of those would have been retired from market after the 'hassle' between the two parts involved in the project. 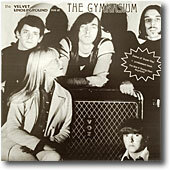 Some copies were also sold as "German 2nd pressing". Anyway there was a reissue around 1984 with different matrix numbers but otherwise identical to the original pressing. Side 1 : 1. Cycle Annie / 2. The Ostrich / 3. Sneaky Pete / 4. You're Drivin' Me Insane / 5. Conversation. Side 2 : 6. Foggy Notion / 7. Inside Your Heart / 8. I'm Sticking With You / 9. Ferryboat Bill / 10. Noise. Sources: 1 : The Beachnuts, 1965 / 2, 3 : The Primitives 45, 1964 / 4 : The Rougnecks, 1965 / 5 : Index flexi, 1966 / 6-9 : rough mix demos, 1969 / 10 : The East Village Other LP, 1966. First edition (1979) has a silk-screened cover. Left hand corner of the back cover reads: "design & silk-screen printing". 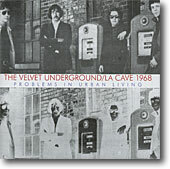 The first reissue (1981) has an ordinary cover. Also exists as blue marble vinyl edition (1990). also ORT-2 and DBH on both sides. Side 1: 1. Waiting For My Man / 2. Berlin / 3. The Black Angel's Death Song / 4. Wild Child / 5. Empty Bottles. Side 2: 6. Heroin / 7. Ghost Story / 8. The Biggest Loudest Heaviest Group Of All / 9. Femme Fatale / 10. All Tomorrow's Parties / 11. Janitor Of Lunacy. 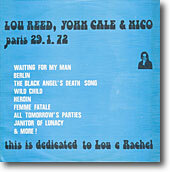 Sources: 1-12 : Lou Reed, John Cale & Nico, Bataclan, Paris, France, January 29, 1972, audience recording. Notes: original edition has blue, black & white cover with pink label. Some copies are plain white with black printing. It offers the audience recording. Side 1: 1. Melody Laughter (27:23). Side 2: 2. The Nothing Song (29:34). Source: Valleydale Ballroom, Columbus OH, November 4, 1966. Notes: Executive producer: Suzanne Vinton. Re-mix: Ron Hamad. Cover: Bernd. 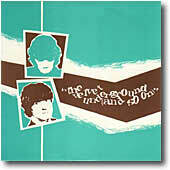 First appearance on record of the two long improvisation tracks from the Columbus '66 tape. Sound quality is good (maybe a little slow). 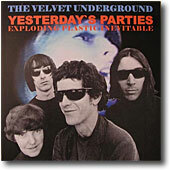 Doug Snyder in Something Was Inevitable (What Goes On issue no.5): "Velvet Underground 1966 was put out by Bernd Baierschmidt. (...) Bernd's girlfriend was the mysterious cover girl." Side 1: 1. Guess I'm Falling In Love (4:07) / 2. It's Alright (The Way That You Live) (2:36) / 3. Pale Blue Eyes (6:16) / 4. One Of These Days (4:01) / 5. Radio Ad (0:58). Side 2: 6. Black Angel's Death Song (2:50) / 7. I'm Not Too Sorry (2:13) / 8. Stephanie Says (2:50) / 9. Loop (6:47). Sources: 1 : The Gymnasium, April 1967 / 2, 7 : Ludlow street loft demos, "1967" / 3 : La Cave, "October 4, 1968"/ 4 : demo, September 23, 1969 / 5: MGM VU-1 promo 45, 1969 / 6 : Cale, Reed & Nico, Bataclan, January 29, 1972 / 8 : A&R studios, Febuary 13, 1968 / 9 : Aspen magazine flexi, 1966. Notes: And So On is the sequel to Etc., including a collection of various rarities. 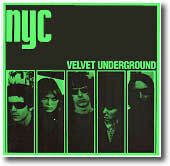 It offers an extensive liner notes by Philip Milstein. Guess I'm Falling In Love is not the same version as the track from the Peel Slowly And See box set. Pale Blue Eyes is from La Cave, October 2, 1968 tape - it doesn't include the false start but has the famous alternate lyrics. Stephanie Says is different mix than official LP VU version. Reissued in 1983, then in 1990, some on green vinyl, some on marble purple/multi-color. Side 1: 1. Soft Summer Breeze/Canadian Sunset (3:09) / 2. Leave Her For Me (2:13) / 3. So Blue (2:08) / 4. Why Don't You Smile Now (2:28) / 5. The Ostrich (2:27) / 6. Sneaky Pete (2:10) / 7. Cycle Annie (2:20). Side 2: 8. I've Got A Tiger In My Tank (2:08) / 9. You're Driving Me Insane (2:20) / 10. Loop (4:26) / 11. Index (4:27) / 12. Noise (1:47). Side 3: 13. Some Kinda Love (3:38) / 14. White Light/White Heat (2:44) / 15. Rock & Roll (5:14) / 16. Ocean (5:09). Side 4: 17. Temptation Inside You Heart (2:29) / 18. I'm Sticking With You (2:25) / 19. Ferryboat Bill (2:10) / 20. Guess I'm Falling In Love (4:07). Side 5: 21. Candy Says (4:13) / 22. Some Kinda Love (10:18) / 23. Cool It Down (3:52) / 24. Who Loves The Sun (2:51). Side 6: 25. I'm Free (1:57) / 26. I Found A Reason (4:47) / 27. Walk And Talk It (1:52) / 28. Head Held High (4:55) / 29. I'm Set Free (5:05). Single: 30. I'm Not Sayin' (2:49) / 31. The Last Mile (2:23). Sources: 1 : Carol Lou Trio, Juke One Stopper single, early 70s / 2-9 : pre-VU recordings / 10 : Aspen flexi, 1966 / 11. Index flexi, 1966 / 12 : East Village Other LP, 1966 / 13 : "Val Valentin mix" alternate take, 1968 / 14 : mono mix, 1967 / 15-19 : rough mix demos, 1968-69 / 20 : The Gymnasium, April 1967 / 21, 22 : Max's Kansas City, August 23, 1970/ 23-28 : Max's Kansas City, rehearsals, summer 1970 / 29 : Max's Kansas City, "July 26, 1970" / 30, 31 : Nico's first single, 1965. 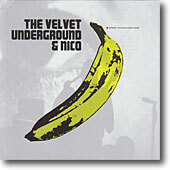 Notes: this 3-LP set comes in a 12x12 inch box set with banana sticker. There are copies with red letters on the box, some with silver letters, and other with gold. Some 'Deluxe' (?) 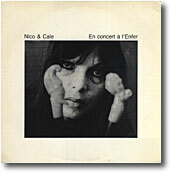 copies came with a counterfeit of Nico's first 45 (on Immediate label). 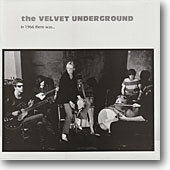 Also some box sets came with two xerox booklets: Souvenir of Discography (compilation of Velvet Underground press articles) and Buried Treasure! (originally published in What Goes On #2). Foggy Notion is listed as first track of side 4 but actually not included. 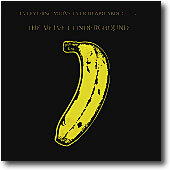 Later copies came with a silkscreened gold banana and white letters and no "extras". Side 1: 1. Femme Fatale / 2. No One Is There / 3. Frozen Warnings. Side 2: 4. Janitor Of Lunacy / 5. I'll Be Your Mirror / 6.The Last Mile / 7. I'm Not Sayin' / 8. Temper. Sources: 1-5 : Lou Reed, John Cale & Nico, Bataclan, Paris, January 29, 1972 / 6-7 : Nico's first single, Immediate IM 003, August 26, 1965 / 8 : outtake from Cale's The Academy In Peril sessions, first issued on promotional compilation Troublemakers (Warner #PRO A 857, 1980). Notes: liner notes say: "Tracks 1-5 were recorded live in 1970, Nico Paffgen and John Cale on vocals, guitar, harmonium, viola." - those tracks are however actually from the Bataclan 1972 reunion (you can even hear Lou Reed saying "John, have Nico tell them this is here last song". The Bataclan part is a bit too slow - Nico's voice wasn't that low - but this is an unedited soundboard version - no cuts. Single tracks volume level is way higher than Bataclan. Temper is a little bit too fast - time on JC's Seducing Down The Door compilation is 15" longer, without more music. Back cover also says: "This is a Penguin Records project again. First edition is limited to 700 copies (really!) but we are too lazy to put a number on each. Hope you enjoy the music". Side 1: 1. What Goes On (5:30) / 2. Move Right In (2:41) / 3. I Can't Stand It (8:01). Side 2: 4. Foggy Notion (10:43) / 5. Heroin (6:30). Sources: 1, 4 : La Cave, Cleveland OH, "October 2, 1968" / 2, 3 : La Cave, "October 4, 1968" / 5 : La Cave, "April 30, 1968". 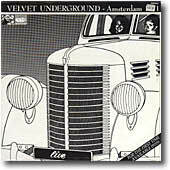 Notes: "cover design & layout by faust", actually a collage made with the VU at Max's 1970 poster. Great sound quality. Gripping liner notes, probably written by Jamie Klimek, the guy who taped those legendary shows at La Cave. This album captures highlights of recordings made in April and October 1968 on a mono Norelco cassette recorder at La Cave in Cleveland, Ohio. 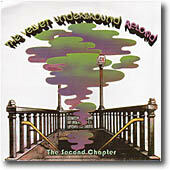 Every track here is vital: from the frenzied What Goes On to Heroin, recorded in April 1968 with Cale. A must-have. 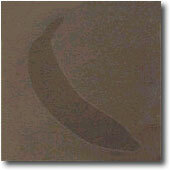 What Goes On is the version which will be officialy released in 1995 on the Peel Slowly And See official CD box set. 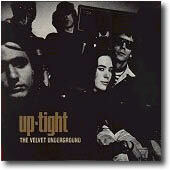 Reissued as Uptight in 1990 (see below). Black & white label with tracklist. Side 1: 1. Sister Ray / 2. White Light/White Heat / 3. Candy Says / 4. Foggy Notion. Side 2: 5. I'm Set Free / 6. Pale Blue Eyes / 7. Heroin / 8. I'm Waiting For The Man. Sources: 1 : Lou Reed and the Tots, Main Point, December 31, 1972 / 2, 5 : Max's Kansas City, "July 26, 1970" / 3, 6 : Max's Kansas City, August 23, 1970 / 4 : rough mix demo, May 6, 1969 / 7 : Lou Reed, John Cale &Nico, Bataclan, January 29, 1972 / 8 : Lou Reed/Patti Smith Group, May 4, 1977. 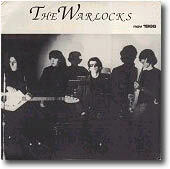 Original 1983 "Incredible Recordmakers, Australia" limited numbered edition of 500 copies on black vinyl. 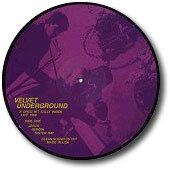 Alternate not numbered "alley" cover art edition with black vinyl record without matrix numbers. Australian alternate "alley" cover art edition with green vinyl record inside. Side 1: 1. She's My Best Friend (2:46) / 2. Andy's Chest (2:49) / 3. Move Right In (6:30) / 4. A Sheltered Life (take 2) (2:54) / 5. Here She Comes Now (take 1) (2:29) / 6. Here She Comes Now (take 2) (2:26). Side 2: 7. You Better Walk It (1:52) / 8. Heroin (5:20) / 9. Venus in Furs (3:27) / 10. Jesus (5:15) / 11. That's The Story Of My Life (1:57). Sources: 1-3 : rough mix demos, 1969 / 4-6 : Ludlow street loft demos, 1967 / 7 : Max's Kansas City, rehearsals, Summer 1970 / 8, 9 : Poor Richard's, Chicago, June 23, 1966 / 10 : La Cave, "October 2, 1968" / 11 : La Cave, October 4, 1968. Notes: front cover photo was shot by Nat Finkelstein at Paraphernalia in 1966. 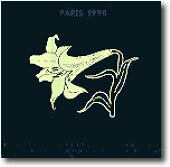 Back cover is Warhol's famous car crash photo. Plain white label. 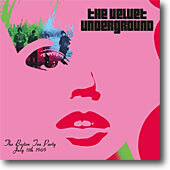 Interesting compilation of various rare tracks - unfortunately sound is slightly muffled. Side 1: 1. Interview / 2. Hedy film soundtrack (excerpt) (13:40) / 3. Interview (0:41). Side 2: 4. Interview (0:26) / 5. Oh! Sweet Nuthin' (7:00) / 6. Women In Revolt film soundtrack (excerpt) (1:02) / 7. The Chelsea Girls film soundtrack (excerpt) (2:31) / 8. Vamp (3:36) / 9. Interview (2:45). Sources: 1, 3, 4, 9 : Music Factory promo LP / 2 : soundtrack, 1965 / 5 : Second Fret, Philadelphia, May 1970 / 6 : film soundtrack, 1968 / 7 : film soundtrack, summer 1966 / 8 : Woodrose Ballroom, Springfield, 17/4/70. Notes: at least 3 different pressings - all with the same matrix numbers and plain white labels. 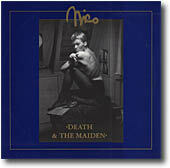 1985 original pressing with black/blue/white cover. 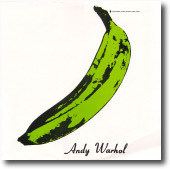 1987 reissue with clear plastic cover with one sided 12"x12" red cardboard cover, "Andy Warhol" stamped in green on the inner sleeve and two postcards. Black & white fold over sleeve with "Andy Warhol" stamped in green ink on lower left hand corner and on inner sleeve. It seems to be a numbered edition, my copy has number 145 stamped on back cover. Side 1: 1. What Goes On / 2. I Can't Stand It Any Longer / 3. Candy Says / 4. Beginning To See The Light / 5. White Light/White Heat / 6. Pale Blue Eyes. Side 2: 7. Heroin / 8. Move Right In / 9. I'm Set Free / 10. Run Run Run / 11. I'm Waiting For The Man. Sources: Boston Tea Party, January 10, 1969. Fantastic Plastic FS66A, USA, 1986 or 88? Side 1: 1. All Tomorrow's Parties / 2. Venus In Furs / 3. Heroin. Side 2: 4. I'm Waiting For The Man / 5. Black Angel's Death Song / 6. Run Run Run. Source: Valleydale Ballroom, Columbus, Ohio, November 4, 1966. 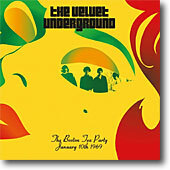 Notes: front cover has a rare photo of the VU live shot by Lisa Law at the Trip in Los Angeles in May 1966. Back cover has a Stephen Shore's photo from the Symphony of Sound filming. This bootleg is a complement to 1966. Also exists as test pressing with handwritten white labels and record in white neutral sleeve. Side 1: 1. What Goes On (7:20) / 2. White Light/White Heat (7:18) / 3. Ferryboat Bill (3:54). Side 2: 4. Jesus (3:25) / 5. Heroin (7:56) / 6. Sister Ray (10:25). Source: 'Guitar amp tape', Boston Tea Party, Boston MA, March 15, 1969. Notes: picture disc. Side 1 carries the tracks listed as side 2. 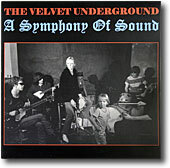 It offers selected tracks from the famous guitar amp tape. It has been said that a regular black vinyl version exists but no evidence of this has been found. Side 1: 1. Femme Fatale / 2. Venus In Furs / 3. All Tomorrow's Parties / 4. I'm Waiting For The Man. Side 2: 5. What Goes On / 6. Heroin / 7. Run Run Run. Sources: 1-4 : Valleydale Ballroom, November 4, 1966 / 5 : "Guitar amp tape", Boston Tea Party, March 15, 1969 / 6 : Bataclan rehearsal, January 1972 / 7 : Hilltop Pop Festival, August 2, 1969. Notes: numbered limited edition of 1000 hand-numbered copies. The record comes in a plain white sleeve with a xeroxed paper wrapped around. I have also seen copies listed as "USA, 1990"...? Side 1: 1. All Tomorrow's Parties (5:15) / 2. I'm Waiting For The Man (3:14) / 3. 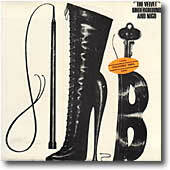 Venus In Furs (4:46) / 4. The Black Angel's Death Song (4:16). Side 2: 5. Heroin (6:53) / 6. Femme Fatale (2:45) / 7. Run Run Run (8:52). Notes: gatefold cover. There are a few differences with the later reissue - the record is inside the left side. The right page reads "Down for you is up", tracklist, and "For promotional use - Not for sale". Back cover has an Easy Flite logo. The sleeve cardboard is flimsy. Notes: Limited edition of 200 numbered copes. 2 black, 1 red and 1 gold - well, yellow - discs. It offers Dylan live in Cologne on June 16 1984. 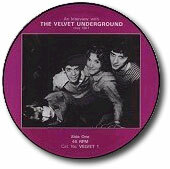 The Velvets are on side 2 and 3 (so on different discs!). 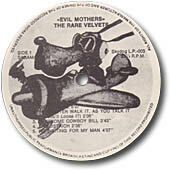 The rumor is that the bootlegger was doing a 3LP on Bob Dylan and a re-issue of the Evil Mothers at the same time and by accident mixed up the matrixes in such a way that the records couldn't be separated and had to be sold as a package deal! The cover of the record is a Bob Dylan cover. 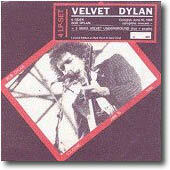 A sticker on the front and a small one on the back saying "VELVET DYLAN" seems to confirm this theory. Side A: 1. Melody Laughter. Side B: 2. Nothing Song. Source: Valleydale Ballroom, Columbus, Ohio, Novermber 4, 1966. Notes: reboot of 1966. Black on black banana cover. Black label. Mat black insert sheet with glossy black liner notes by Nicholas Black. Source: Music Factory promo LP, 1968. Notes: picture-disc. Side 2 is the same as side 1 so only half the Reed/Cale interview is presented. The transcript of the complete interview is available in Forced Exposure #7/8, 1985. Side 1: 1. Chelsea Girl / 2. Sister Ray. 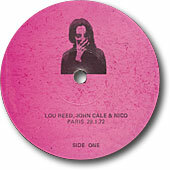 Sources: 1 : Nico & Joe Bidewell, BBC TV program on Chelsea Hotel, 1981 / 2 : Lou Reed, Dusseldorf, Germany, April 1, 1979 / 3 : Lou Reed, Bottom Line, February 28, 1983 - same as on RCA video A Night With Lou Reed / 4 : Lou Reed singing live over the instrumental version for the Italian TV / 5 : Lou Reed, 1977 / 6 : Lou Reed, 1975 & Velvet Underground, Aspen #3 flexi, 1966 / 7 : Angus MacLise, Aspen #9 flexi, 1970. Side 1: 1. Sweet Sister Ray (21:01). Side 2: 2. Sweet Sister Ray (18:07). Side 3: 3. Sister Ray (25:15). Side 4: 4. Sister Ray (25:02). Sources: 1, 2 : La Cave, April 30, 1968 / 3. The Boston Tea Party, December 12, 1968 / 4 : 'guitar amp' tape, The Boston Tea Party, March 15, 1969. Notes: the first record offers about 40 minutes of Sweet Sister Ray intro to Sister Ray! 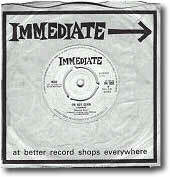 Second record has the famous blasting 'guitar amp' Sister Ray. Back cover says side 3 is from Second Fret, Philadelphia, Jan 1970 but this version comes actually from the December 12, 1968 Boston Tea Party tape and is sometimes considered as the best version ever. The records come in a great picture cover using the two famous shots by Ken Greenberg, originally published in Crawdaddy! magazine in 1968. Definitely E.S.S.E.N.T.I.A.L.! LP1 - Side 1: 1. Andy Warhol Says (0:54) / 2. Venus In Furs (1:43) / 3. Heroin (2:00) / 4. Heroin (5:13) / 5. Venus In Furs (3:23) / 6. I'm Waiting For The Man (5:50) / 7. White Light/White Heat (4:04). LP1 - Side 2: 8. Foggy Notion (7:06) / 9. Beginning To See The Light (5:14) / 10. Sister Ray (8:55). LP2 - Side 1: 11. What Goes On (11:12) / 12. Run Run Run (7:31) / 13. Candy Says (3:49) / 14. Oh Jim (1:13). LP2 - Side 2: 15. I Can't Stand It (5:46) / 16. Sister Ray (20:42). LP3 - Side 1: 17. Sweet Jane (5:20) / 18. Over You (2:54) / 19. Intro (2:38) / I'm Waiting For The Man (6:21) / 20. Chelsea Girl (3:01). LP3 - Side 2: 21. Heroin (7:56) / 22. Sister Ray/Leave Me Alone (16:46) / 23. I'm Sticking With You (2:23). Sources: 1-3 : WNET TV, NYC, February 1966 / 4, 5 : Poor Richard's, Chicago, June 23, 1966 / 6 : La Cave, October 4, 1968 / 7, 8, 10, 17, 18 : 2nd Fret, January 1970 / 9, 15, 16 : Boston Tea Party, January 10, 1969 / 11, 12 : Hilltop Pop Festival, August 2, 1969 / 13 : Boston Tea Party, March 13, 1969 / 14 : Woodrose Ballroom, Springfield MA, April 17, 1970 / 19 : John Cale, 1984, overdubbed by Sterling Morrison in September 1985, Arsenal TV show / 20 : Nico + Joe Bidewell, BBC TV, 1981 / 21, 22 : Lou Reed, Plaza Las Arenas, Barcelona, June 1980 / 23 : Moe Tucker w/ Jonathan Richman, studio recording, 1974. Notes: 500 copies made. "Produced by Fatty and Butch". 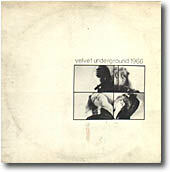 Some boxes included a two-sided poster of VU and Warhol photographs (some very rare) backed with liner notes by Butch with lyrics to Sister Ray, and setlists for 1-15-70 and 1-21-70 shows. 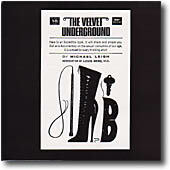 Others included a glossy flyer of the liner notes; others included a large sticker copy of the cover. Side 1: 1. Head Held High (3:14) / 2. I'm Set Free (4:19) / 3. Run Run Run (7:30) / 4. Candy Says (3:58). Side 2: 5. That's The Story Of My Life (2:10) / 6. Train Round The Bend / Oh! Sweet Nuthin' (16:27). Sources: 1, 6 : 2nd Fret, Philadelphia, May 1970 / 2, 3 : Boston Tea Party, January 10, 1969 / 4 : Boston Tea Party, December 12, 1968 / 5 : Boston Tea Party, March 13, 1969. Notes: pretty good collection of live tracks from various sources. This LP was initially advertised by a mail shot of postcards. Rare pictures of Moe on each label. Side 1: 1. White Light/White Heat / 2. Sweet Sweet Jane / 3. Over You / 4. Foggy Notion. Side 2: 5. Andy Warhol's Chelsea Girls Soundtrack. Side 3: 6. I'm Waiting For The Man / 7. Run Run Run / 8. Pale Blue Eyes. Side 4: 9. What Goes On / 10. Heroin. 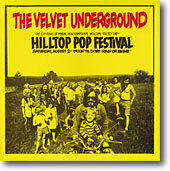 Sources: 1-4 : 2nd Fret, Philadelphia, January 2, 1970 / 5 : Chelsea Girls film soundtrack, 1966 / 6-10 : Hilltop Pop Festival, August 2, 1969. 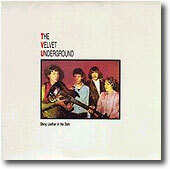 Notes: the "Shiny" tapes did come from a radio broadcast in Cambridge MA, when those tapes got played on the radio during a finals study marathon Velvet Underground radio show. Reissued in 1990 on colored vinyl. Side 1: 1. All Tomorrow's Parties (5:19) / 2. I'm Waiting For The Man (3:19) / 3. Venus In Furs (4:51) / 4. The Black Angel's Death Song (4:20). Side 2: 5. Heroin (6:59) / 6. Femme Fatale (2:50) / 7. Run Run Run (8:57). Notes: reissue of Down For You Is Up LP. Compare with first edition, it has a stronger sleeve, the record is stored in right page of the fold out sleeve. There no mention of the record as being a promotional item, or any other reference to the maker of the record. The records have also different matrix numbers. Exists in black, white, pink, or clear marble vinyl - all with the same matrix numbers. Some have on orange "LIMITED - COLOURED VINYL - EDITION" on the front. Side 1: 1. Can't Stand It / 2. Sheltered Life / 3. I'm Not Sayin / 4. She's My Best Friend. Side 2: 5. Move Right In / 6. Andy's Chest / 7. The Last Mile / 8. Here She Comes Now / 9. Rock 'n' Roll / [10. Sweet Jane / 11. Lonesome Cowboy Bill]. Sources: 1, 5 : La Cave, October 4, 1968 / 2, 8 : Ludlow Street demos, 1967 / 3, 7 : Nico 45, 1965 / 4, 6, 9 : rough mix demos, 1969 / 10, 11 : Max's Kansas City, Summer 1970. Notes: there are five more or less different versions of this album. Blue marbled color. Vinyl. Black label. B/w sleeve. Green marbled color vinyl. Black label. B/w sleeve. Red vinyl. Grey/white label. B/w sleeve with orange "limited edition - coloured vinyl" sticker. 1990 reissue from Italy. Clear vinyl. Amazing Kornyfone label. Plain sleeve with green/black inlay. 1990 reissue from Italy. 1-4 have the same matrix numbers. 5 is different (009-B / 009-A, labels are inverted). Tracks 10 & 11 only appear on the Kornyfone reissue while only the Revisited editons have liner notes on back cover. Side 1: 1. I'm Waiting For The Man (4:54) / 2. Bare Changed (3:31) / 3. Some Kinda Love (6:51) / 4. White Light White Heat (4:33) / 5. Hold On (4:58) / 6. What Goes On (4:02). Side 2: 7. Cool It Down (4:07) / 8. Back On The Farm (7:04) / 9. Oh Sweet Nuthin' (8:21) / 10. After Hours (3:19) / 11. Dopey Joe (3:23) / 12. Rock 'n' Roll (4:43). Source: Concertgebouw, Amsterdam, Netherlands, November 19, 1971. Notes: new edition of sides 3 and 4 of Searchin' For My Mainline 3LP set. Side 2: 4. Foggy Notion / 5. Heroin. Sources: 1, 4 : La Cave, "October 2, 1968" / 2, 3 : La Cave, October 4, 1968 / 5 : La Cave, April 30, 1968. 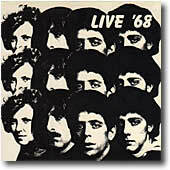 Notes: reissue of Live '68, with different a picture cover and without liner notes. White label. Side 1: 1. Sister Ray / Murder Mystery / Sister Ray (28:18). Side 2: 2. Waiting For My Man (9:14) / 3. 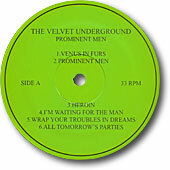 Venus In Furs (3:59) / 4. The Story Of My Life (1:56) / 5. What Goes On (5:30). Sources: 1, 2 : La Cave, January 29, 1969 / 3, 5 : La Cave, October 4, 1968, early show / 4: La Cave, October 4, 1968, late show. 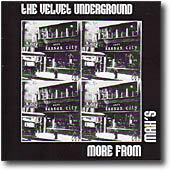 Notes: a pretty good collection of tracks recorded live at La Cave in Cleveland and a nice sequel to Live '68 bootleg. What Goes On is moreover the same version on both records. Back cover says "All tracks recorded at La Cave, Cleveland, Ohio, October 23, 1968", but all the tracks come actually from other dates at La Cave. Back cover uses a photo by Ronn Campisi shot at the Boston Tea Party, 1969. Side 1: 1. Leave Her For Me / 2. So Blue / 3. Why Don't You Smile Now / 4. (Do) The Ostrich / 5. Sneaky Pete / 6. Cycle Annie / 7. I've Got A Tiger In My Tank / 8. You're Driving Me Insane / 9. Walk It As You Talk It (1:59). Side 2: 10. Ride Into The Sun / 11. Beginning To See The Light / 12. All Tomorrow's Parties / 13. Heroin. Sources: 1-8 : pre-VU tracks / 9 : Max's Kansas City, rehearsals, summer 1970 / 10 : demo, 1969 / 11 : unedited version, 1968 / 12 : "one vocal track" version, 1966 / 13 : Fondation Cartier, June 15, 1990. Notes: first edition with yellow label. Reissued with black and white label. Also exists without catalog number. Beginning... is the unedited version which fades out a few seconds later. Ride Into The Sun is the demo version which also appears on What Goes On CD box set. Side 2: 6. Heroin (9:55) / 7. The Soundcheck (15:17). Source: Fondation Cartier, Jouy-En-Josas, France, June 15, 1990. Notes: beautiful illuminous cover! A3 xerox insert with black and white photographs backed with press clippings. Back cover reads "FOR PROMOTION ONLY · NOT FOR SALE · MADE IN FRANCE". Side 1: 1. I'm Waiting For The Man (7:26) / 2. It's Just Too Much (2:54) / 3. I'll Be Your Mirror (2:56) / 4. Some Kinda Love (4:25). Side 2: 5. Femme Fatale (3:27) / 6. Beginning To See The Light (5:58) / 7. I'm Set Free (4:41) / 8. After Hours (2:49). Side 3: 9. I'm Sticking With You (2:40) / 10. One Of These Days (3:29) / 11. Pale Blue Eyes (6:23) / 12. Ocean (6:02) / 13. What Goes On (6:22). Side 4: 14. Heroin (7:17) / 15. Sister Ray (17:47). Sources: 1-14 : End Of Cole Ave, Dallas, Texas, 19/10/1969 / 15 : End Of Cole Ave, 18/10/1969. Notes: limited numbered edition, coming in a purple velvet bag with sticker. 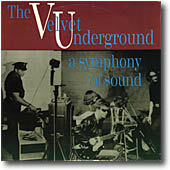 Gatefold cover, blue vinyl records. Great bootleg, same as the CD version minus the 'Afterhours' stuff. Side 1: 1. Andy Warhol speaks / 2. A Symphony Of Sound. Side 2: 3. Heroin / 4. Venus In Furs / 5. Exploding Plastic Inevitable / 6. Heroin. Side 3: 7. I Can't Stand It / 8. Waiting For My Man / 9. Ferryboat Bill / 10. Heroin. Side 4: 11. What Goes On / 12. White Light/White Heat / 13. Beginning To See The Light. Sources: 1 : WNET TV, December 1965 / 2 : Film soundtrack, Fall 1966 / 3, 4 : Poor Richard's, June 23, 1966 / 5 : Valleydale Ballroom, November 11, 1966 / 6 : Fondation Cartier, June 15, 1990 / 7-13 : "guitar amp tape", Boston Tea Party, March 15, 1969. 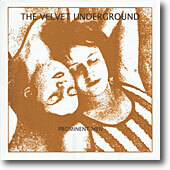 Notes: Andy Warhol Speaks includes Venus In Furs and Heroin. Side 1 ends with unlisted tracks: a radio ad for EPI at the Trip in Los Angeles 1966 and a brief excerpt from The Nothing Song Columbus 1966. Exploding Plastic Inevitable is actually an excerpt of Melody Laughter. Side 1: 1. Venus In Furs / 2. Guess I'm Falling In Love / 3. All Tomorrow's Parties / 4. Some Kinda Love / 5. Femme Fatale. Side 2: 6. I'm Sticking With You / 7. Black Angel Death Song / 8. Heroin / 9. Pale Blue Eyes / 10. Coyote. Source: Wembley Arena, London, June 6, 1993.
no label, no number, Italy, 1993? Side 1: 1. What Goes On / 2. White Light White Heat / 3. Ferryboat Bill. Side 2: 4. Jesus / 5. Heroin / 6. Sister Ray. Source: 'guitar amp' tape, The Boston Tea Party, March 15, 1969. Notes: neutral white cover with a pink xeroxed photo sheet pasted. 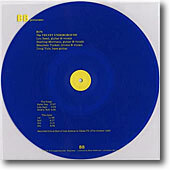 It reads "promotional copy not for sale", and "this is a limited pressing of 50 numbered copies". Plain white labels. Side 1: 1. Early Tuesday Morning Blues / 2. Run Run Run / 3. What Goes On. Side 2: 4. Sister Ray / 5. Countess Of Hong Kong / 6. I Found A Reason / 7. Real Good Time Together. Sources: 1 : La Monte Young Theater Of Eternal Music, 1963 / 2, 3 : Hilltop Pop Festival, August 2, 1969 / 4 : End of Cole Ave, October 18, 1969 / 5-7 : demos, late 1969. Side 1: 1. Real Good Time Together / 2. Venus In Furs / 3. Fever In My Pocket / 4. If You Close The Door / 5. All Tomorrow's Parties. Side 2: 6. Some Kinda Love / 7. I'll Be Your Mirror / 8. Beginning To See The Light / 9. I Heard You Call My Name / 10. Femme Fatale. Side 3: 11. Mr Rain / 12. Sweet Jane. Side 4: 13. I'm Sticking With You / 14. Black Angel's Death Song / 15. Rock'n'roll / 16. White Light/White Heat / 17. Heroin. 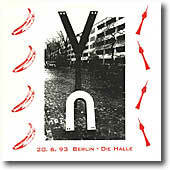 Source: Die Halle, Berlin, Germany, June 20, 1993. Notes: limited edition of 250 hand-numbered copies, "dedicated to Sterling Morrison 1942-1995". Silkscreened cover. 2 labels read "Kontroll Punkt Rekords", the other 2 read "Check Point Records". Fever In My Pocket is actually Guess I'm Falling In Love and If You Close The Door, After Hours. Heroin is listed on the label as I'm Waiting For The Man... It has not the complete show - The Gift, Pale Blue Eyes and Coyote are missing. Side 1: 1. Venus In Furs / 2. Prominent Men / 3. Heroin / 4. I'm Waiting For My Man / 5. Wrap Your Troubles In Dreams. Side 2: 6. All Tomorrow's Parties / 7. There Is No Reason / 8. Sheltered Life / 9. It's Allright (The Way That You Live) / 10. I'm Not Too Sorry / 11. Here She Comes Now / 12. Guess I'm Falling In Love / 13. Booker T.
Source: 1-6: recorded 1965 in John Cale's loft in Ludlow St. lower Manhattan / 7-11: recorded 1967 in John Cale's loft in Ludlow St. lower Manhattan / 12 & 13: recorded live April 1967 at the Gymnasium, New York City. Notes: all tracks pirated from the official Peel Slowly And See 5-CD box set - for completist collectors only... Also exists as white marble vinyl. Side 1: 1. Ride Into The Sun (demo) / 2. Ocean (demo) / 3. I'm Sticking With You (alternate mix) / 4. I Love You (demo) / 5. Rock 'n' Roll (alternate mix) / 6. 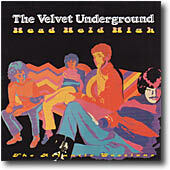 Head Held High (alternate mix). Side 2: 7. Satellite Of Love (alternate demo) / 8. I Love You (outtake) / 9. Oh Gin (demo) / 10. Walk And Talk (demo) / 11. Sad Song (demo) / 12. Love Makes You Feel Ten Feet Tall (demo). Source: Spring/Summer 1970, Atlantic Recording Studios, New York NY. Notes: all tracks pirated from the official Loaded - Fully Loaded Edition... Front cover artwork is also pirated from the 1970 German compilation Pop History Vol. 19. Also exists with alternate Verve-like black label. Side 1: 1. Who Loves The Sun (alternate mix) / 2. Sweet Jane (early version) / 3. Rock & Roll (demo) / 4. Cool It Down (early version) / 5. New Age (full-length version). Side 2: 6. Head Held High (early version) / 7. Lonesome Cowboy Bill (early version) / 8. I Found A Reason (demo) / 9. Train Round The Bend (alternate mix) / 10. Oh! Sweet Nuthin' (early version). Source: Spring/Summer 1970, Atlantic Recording Studios, N.Y.C. Notes: limited edition of 1000 on 220g vinyl. All tracks pirated from the official Loaded - Fully Loaded Edition. Side 1: 1. White Light/White Heat / 2. I'm Set Free / 3. Candy Says. Side 2: 4. Who Loves The Sun / 5. Sweet Jane / 6. Some Kinda Love. Source: August 23, 1970, Max's Kansas City, New York City NY. Notes: "the remaining previously unreleased songs from the "Live at Max's Kansas City" LP tapes recorded on the twenty third of August nineteen seventy, Lou Reed's final concert with the band." Side 1: 1. The Nothing Song (24:11). Side 2: 2. Untitled Jam Track (24:24). 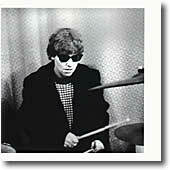 Source: 1: Valleydale Ballroom, Colombus, Ohio, November 4, 1966 / 2: The Dom, NYC April 1966. Notes: 1000 copies only, all individually hand-numbered, blue paper insert with reprint of A "High" School of Music and Art article by John Wilcok, originally published in The East Village Other, Vol. 1 No. 10, April 15 - Matrch 1, 1966. Side 1: 1. Untitled Part 1 (23:42). Side 2: 2. Untitled Part 2 (24:49). 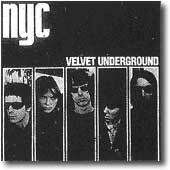 Source: 1-2: The Velvet Underground And Nico film soundtrack, Factory, New York City NY, 1966. Notes: 1000 copies only, all individually hand-numbered. World Youth Records, 5-9 Kitangasadori, Higashi-Ku, Osaka, Japan. 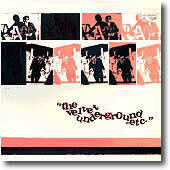 3 inserts: 1 12x12" page of stills from Andy Warhol's movie The Velvet Underground And Nico (aka A Symphony of Sound; 4 sided purple A4 paper typed article of The View from the Bandstand by Lou Reed. Side 1: 1. European Son / 2. The Black Angel's Death Song / 3. All Tomorrow's Parties / 4. I'll Be Your Mirror. Side 2: 5. Heroin / 6. Femme Fatale / 7. Venus In Furs / 8. I'm Waiting For The Man / 9. Run Run Run. 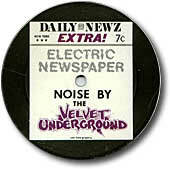 Source: 1-9: Norman Dolph's acetate, Scepter Studios, New York City NY, April 1966. Side 1: 1. I'm Not A Young Man Anymore (7:17) / 2. Guess I'm Falling In Love (4:18) / 3. I'm Waiting For The Man (5:24) / 4. Run Run Run (6:55). Side 2: 5. Sister Ray (18:55). Source: 1-5: The Gymnasium, New York City NY, April 1967. Notes: limited edition of 100 copies on green vinyl. Also exists as regular black vinyl, and orange vinyl. Guess I'm Falling In Love is the same version as the one that appeared on the official Peel Slowly And See 5CD boxset. Side 1: 1. 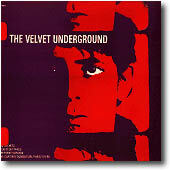 Andy Warhol Talks About The Velvet Underground (0:33) / 2. Heroin (6:16) / 3. Miss Joanie Lee (11:56) / 4. Instrumental (1:17). Side 2: 5. Get It On Time (2:20) / 6. Boom Boom (6:23) / 7. Green Onions (6:00) / 8. I'll Be Your Mirror (Vocals: Lou) / 9. There She Goes Again (Vocals: Lou). Side 3: 10. Walk Alone (3:10) / 11. 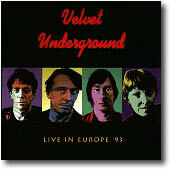 Venus In Furs/Craking Up (3:10) / 12. Instrumental (3:08) / 13. There She Goes Again (Vocals: Nico) / 14. Instrumental (5:22). Side 4: 15. Heroin (4:12) / 16. I'll Keep It Mine (3:42) / 17. European Son (4:12) / 18. Sheltered Life (Take 1) (2:52) / 19. Here She Comes Now (Take 2) (2:26) / 20. Noise (1:45). Source: 1: USA Artists, WNET-TV, New York City NY, February 7, 1966 / 2-4, 6-7, 9-14: The Factory, New York City NY, January 3, 1966 / 5, 8: The Factory, New York City NY, March 7, 1966 / 15-17: Andy Warhol - Up-tight, Film-Maker's Cinematheque, New York City NY, February 6, 1966 / 18-19: John Cale's Ludlow St. Loft, New York City NY, Winter 1966 / 20: The East Village Other - Electric Newspaper LP - Hiroshima Day, August 6, 1966. Notes: exists on blue or red colored vinyl. Andy Warhol/Nico Batman & Robin labels. "Lovingly compiled by Rover with thanks to RR! Dedicated to loving memory of Sterling Morrison. PLAY VERY LOUD!" Side 1: 1. Waiting For The Man / 2. Run Run Run. Side 2: 3. Pale Blue Eyes / 4. What Goes On / 5. Heroin. Source: 1-5: Hilltop Pop Festival, Mason NH, August 2, 1969. Notes: liner notes read "The tracks on this releases have been taken from the Master Tapes cleaned up and restored." 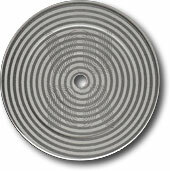 Side A: 1. European Son / 2. Black Angel's Death / 3. All Tomorrow's Parties / 4. I'll Be Your Mirror. Side B: 5. Heroin / 6. Femme Fatale / 7. Venus In Furs / 8. I'm Waiting For The Man / 9. Run Run Run. Sources: 1, 6 : 2nd Fret, Philadelphia, May 1970 / 2, 3 : Boston Tea Party, January 1, 1969 / 4 : Boston Tea Party, December 12, 1968 / 5 : Boston Tea Party, March 13, 1969. Notes: reissue of the 1988 original bootleg. Side A: 1. I'm Not A Young Man Anymore / 2. Guess I'm Falling In Love / 3. I'm Waiting For The Man / 4. Run Run Run. Side B: 5. Sister Ray. 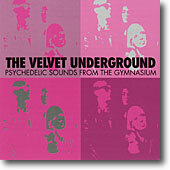 Sources: 1-5: The Gymnasium, New York NY, April 30, 1967. Notes: also exists on CD (XTVCD-144) with Booker T. as additional track. Side A: 1. Venus In Furs / 2. Prominent Men / 3. Heroin / 4. I'm Waiting For The Man / 5. Wrap Your Troubles In Dreams. Side B: 6. There Is No Reason / 7. Sheltered Life / 8. It's All Right (The Way That You Live) / 9. I'm Not Too Sorry (Now That You're Gone) / 10. Here She Comes Now. 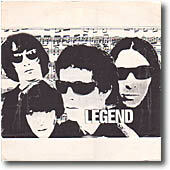 Sources: 1-5: Demos, July 1965, John Cale's Ludlow Street loft, New York NY / 6-10: Demos, New York NY, December 1965. Notes: limited edition of 500 hand-numbered regular black vinyl copies plus 100 hand-numbered green vinyl copies. 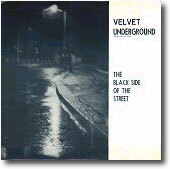 Also exists as limited edition of 500 copies with with plain red label, plus a limited edition of 100 blue vinyl copies. Side A: 1. Intro To The Show (1:30) / 2. I'm Waiting For The Man (5:32) / 3. It's Just Too Much (2:54) / 4. I'll Be Your Mirror (2:19) / 5. Some Kinda Love (3:37) / 6. Femme Fatale (2:41) / 7. Beginning To See The Light (5:45) / 8. I'm Set Free (4:20). Side B: 9. One Of These Days (3:23) / 10. Pale Blue Eyes (6:00) / 11. Ocean (6:02) / 12. What Goes On (6:13) / 13. Heroin (7:05). Sources: 1-13: End of Cole Ave., Dallas TX, October 19, 1969. 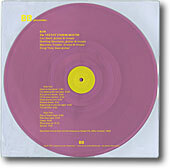 Notes: 140 gram LP, clear purple vinyl in transparent PVC sleeve with yellow lettering, limited edition of 500 copies. "Licenced by Edna Welthorpe". Side A: The Songs: 1. Sister Ray / 2. Lisa Says / 3. Rock 'a 'Roll. Side B: The Jams: 4. 1st / 5. 2nd / 6. 3rd / 7. 4th. Sources: 1-7: End of Cole Ave., Dallas TX, October 19, 1969. Notes: 140 gram LP, clear blue vinyl in transparent PVC sleeve with yellow lettering, limited edition of 500 copies. Side 1: 1. Move Right In / 2. I Can't Stand It / 3. What Goes On / 4. Waiting For The Man. Side 2: 5. Pale Blue Eyes / 6. Foggy Notion / 7. Heroin. Side 3: 8. Jesus / 9. Venus In Furs / 10. Beginning To See The Light. Side 4: 11. Sister Ray / 12. That's The Story Of My Life. Sources: 1-12: La Cave, Cleveland OH, early October 1968. Notes: gatefold sleeve, 180 gram LPs. Sources: 1, 2 : La Cave, Cleveland OH, April 30, 1968 / 3. The Boston Tea Party, Boston MA, December 12, 1968 / 4 : 'guitar amp' tape, The Boston Tea Party, Boston MA, March 15, 1969. 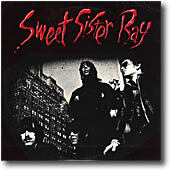 Notes: "remastered" 'fan-club style' reissue of original Sweet Sister Ray bootleg. 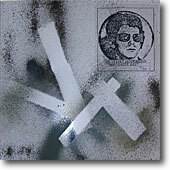 Spray painted cover with xeroxed picture pasted on front. First LP is on regular black wax, second one on brown wax. Plain white labels with one side stamped (black one with skull, brown one with ghost). Limited hand-numbered edition of 300 copies. A limited edition of 13 copies titled Half Sister including the black wax LP was produced late 2013 in special hand-painted thin sleeve. Side 1: 1. It's Just Too Much (3:05) / 2. Waiting For The Man (5:18) / 3. I Can't Stand It (7:21) / 4. I'm Set Free (4:56) / 5. Beginning To See The Light (5:42). Side 2: 6. Ocean (6:11) / 7. Venus In Furs (5:04) / 8. What Goes On (5:42) / 9. Heroin (7:44). Side 3: 10. I'll Be Your Mirror (2:42) / 11. Femme Fatale (2:58) / 12. Pale Blue Eyes (6:14) / 13. Candy Says (5:32) / 14. Jesus (3:34) / 15. That's The Story Of My Life (2:05). Side 4: 16. I Found A Reason (2:45) / 17. Sunday Morning (2:55) / 18. After Hours (2:37) / 8. Jam (16:25). Sources: all tracks: The End Of Cole Ave., Dallas TX, October 18, 1969. Notes: 180 gram vinyl. 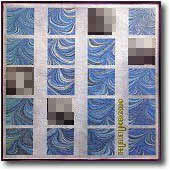 Also released on CD. Side 1: 1. I'm Waiting For The Man (7:26) / 2. It's Just Too Much (2:54) / 3. I'll Be Your Mirror (2:55) / 4. Some Kinda Love (4:24) / 5. Femme Fatale (3:27) / 6. Beginning To See The Light (5:57) / 7. I'm Set Free (4:40). Side 2: 8. After Hours (2:49) / 9. I'm Sticking With You (2:40) / 10. One Of These Days (3:29) / 11. Pale Blue Eyes (6:23) / 12. Ocean (6:02) / 13. What Goes On (6:22). Side 3: 14. Heroin (7:17) / 15. Sister Ray (17:47) / 16. Lisa Says (3:39). Side 4: 17. Blue Velvet Jazz Jam (30:14). 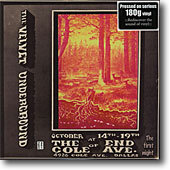 Sources: all tracks: The End Of Cole Ave., Dallas TX, October 19, 1969, except "Blue Jazz Velvet Jam" (Side 4) which was probably recorded on October 18, 1969. Side 1: 1. Heroin (9:11) / 2. Move Right In (5:42) / 3. Waiting For The Man (7:17). Side 2: 4. I'm Set Free (5:02) / 5. Foggy Notion (8:17) / 6. Beginning To See The Light (6:17) / 7. Candy Says (4:44). Side 3: 8. White Light/White Heat (5:18) / 9. Jesus (4:50) / 10. Sister Ray (fade out at 11:00). Side 4: 11. Sister Ray (fade in at 11:20) / 12. Pale Blue Eyes (6:09). 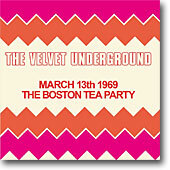 Sources: all tracks: The Boston Tea Party, Boston MA, December 12, 1968. Notes: 180 gram vinyl. Single sleeve with "KEYHOLE | Pressed on serious 180g vinyl | Rediscover the sound of vinyl" sticker on shrinkwrap. Pale Blue Eyes is miscredited as "Paul Blue Eyes" on back cover. Also released on CD. 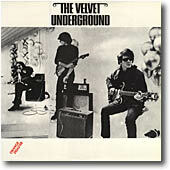 "1968 was a tumultous year for the Velvet Underground, with the departure of John Cale, the addition of Doug Yule, a gruelling touring schedule and considerable musical transition. Supported by the MC5, the quartet played their final shows of the year at the Boston Tea Party, which Lou Reed once described as his favorite place to play. This legendary live recording find them playing reworked version of early classics as well as several songs that would appear on their forthcoming third album, and two tracks that went unreleased in their lifetime. It's presented here together with background notes and photographs." Side 1: 1. Heroin (6:21) / 2. Candy Says (5:08) / 3. Ferryboat Bill (5:14) / 4. I'm Waiting For The Man (6:16). Side 2: 5. I'm Set Free (5:01) / 6. What Goes On (7:45) / 7. I Can't Stand It (5:45). Side 3: 8. Beginning To See The Light (6:17) / 9. That's The Story Of My Life (2:33) / 10. White Light/White Heat (7:30) / 11. Jesus (4:33). Side 4: 12. Sister Ray (21:49). 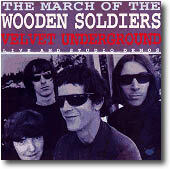 Sources: all tracks: The Boston Tea Party, Boston MA, March 13, 1969. Notes: 180 gram vinyl. Single sleeve with "KEYHOLE | Pressed on serious 180g vinyl | Rediscover the sound of vinyl" sticker on shrinkwrap. Also released on CD. 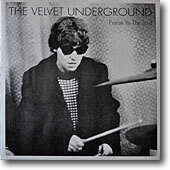 "Coinciding with the March 1969 release of their third album, the Velvet Underground played three nights at the Boston Tea Party, which Lou Reed once described as his favorite place to perform. By that time Doug Yule was well established as an important contributor to the band, and their set confidently reworks some confrontational early classics as well as incorporating some glorious ballads. The March 13th set is presented here together with background notes and photographs." Side 1: 1. Heroin (8:26) / 2. I'm Gonna Move Right In (4:46) / 3. I'm Set Free (4:37) / 4. Run Run Run (7:49). Side 2: 5. Waiting For The Man (8:57) / 6. What Goes On (4:30) / 7. I Can't Stand It (6:18) / 8. Candy Says (4:47). Side 3: 9. Beginning To See The Light (5:49) / 10. White Light/White Heat (5:42) / 11. Pale Blue Eyes (6:28). Side 4: 12. Sister Ray (21:24). Sources: all tracks: The Boston Tea Party, Boston MA, January 10, 1969. Notes: 180 gram vinyl. Gatefold sleeve with "spyGLASS | Pressed on serious 180g vinyl | Rediscover the sound of vinyl" sticker on shrinkwrap. Also released on CD. 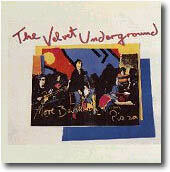 "Doug Yule joined the VU in October 1968, and had become an important contributor to the band by early 1969. 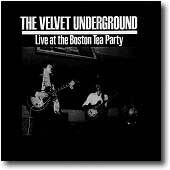 This superb live set was taped on January 10th at the Boston Tea Party, which Lou Reed once described as his favorite place to play, and finds the quartet tearing through a series of extented and reworked versions of their classics, with fiery guitar interplay throughout. An essential document of a great band at their most vital, it's presented here together with background notes and images." Side 1: 1. I'm Waiting For The Man (9:27) / 2. Jesus (4:00). Side 2: 3. Run Run Run (16:14) / 4. I'm Set Free (6:25). Side 3: 5. White Light/White Heat (7:16) / 6. Candy Says (5:06) / 7. Pale Blue Eyes (5:06) / 8. Beginning To See The Light (8:51). Side 4: 12. Sister Ray/The Murder Mystery (22:29). 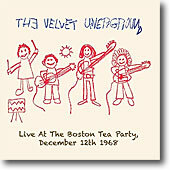 "The Boston Tea Party was that venue's leading underground rock club, and something of a home for the Velvet Underground. Lou Reed even dscribed it as his favorite place to play in the late 60s. This superb live set was taped on Friday, July 11th, and finds the quartet performing numerous tracks from their recently released third album, as well as epic renditions of Run Run Run and Sister Ray. An essential document of a great band at their peak, it's presented here together with background notes and images." Side 1: 1.Sweet Jane / 2. Hedy (excerpt) / 3. Sister Ray (excerpt). Side 2: 4. I Wanna Be Black / 5. Temporary Think (sic) / 6. 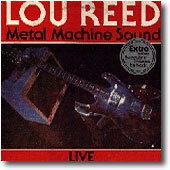 Metal Machine Improvisation. Sources: 1, 4 : Lo Reed, Bottom Line, NYC, 1978 / 2 : Hedy soundtrack, 1965 / 3 : Boston Tea Party, March 1969 / 5 : Lou Reed, Detroit, 22/11/1976 / 6 : Lou Reed, Coda to Charley's Girl, Den Haas, 5/4/1977. Notes: cover credited to Stijn & Afan. Notes: limited hand-numbered edition of 500 copies in clear-coloured vinyl, with a postcard. This collection of rare Nico cuts includes a 3:00 excerpt of Melody Laughter, one of the two long improvisations performed by the Velvet Underground during the EPI show at Valleydale Ballroom in Colombus OH on November 4, 1966. Thanks: Gordon Lyon, Chris Van Tuyll, Enrique Miquel, Lau Buur Nielsen, Alfredo Garcia, Alessandro Santamaria, Pieter de Jong, Gavin Roberts, Michael Barbara, Rick Rod.